While humans wait for the age of 5G to take shape, the next generation of wireless connectivity is already changing the lives of 50 British cows. A dairy farm at the government-funded Agricultural Engineering Precision Innovation Centre in Shepton Mallet, England, has fitted about a third of its cows with 5G-connected smart collars as part of a test for Cisco Systems — and the impact of this one trial could affect the future of agriculture. When a smart collar-fitted cow wants to be milked, it approaches a robotic milking system. This system knows how to latch onto each individual cow’s teats for milking, and because the collar lets it quickly identify the cow, the robot can get down to business right away while the animal munches on a food reward. 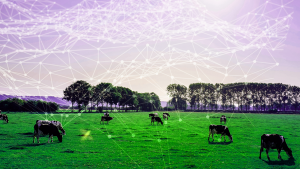 If Cisco can prove the viability of using 5G on farms, it could do more than save cows from experiencing the pain and possible infection that can follow a delay in milking. More on 5G: There’s More to 5G Than You Think. Here’s How Our Networks Have Evolved. The post 5G Collars Let Cows Choose When They Want to Be Milked appeared first on Futurism.